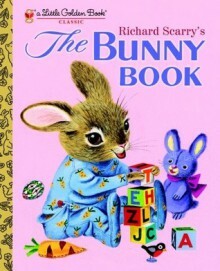 A daddy bunny plays with his baby bunny and says, “What will our baby be when he grows up?” Everyone, from the baby’s mother to big sister to Great Aunt Bunny, seems to know: a clown, a policeman, a candy store owner. But the baby only nibbles on his carrot and looks wise . . . for he knows he will grow up to be a nice daddy bunny! Enjoyed this as a child.